HopeWalks Raises $225k for Cancer! The Newton-Wellesley Hospital Charitable Foundation recently held its seventh annual HopeWalks event. It was a huge success- resulting in 650 walkers and more than $225,000 raised to benefit the Integrative Support Services offered at the Vernon Cancer Center. These life-enhancing services for cancer patients optimize healing and comfort throughout treatment. Newton-Wellesley Hospital wants to make these services available to all patients, regardless of their ability to pay. Donations may still be made to HopeWalks at www.nwh.org/hopewalks or by calling (617) 243-6243. 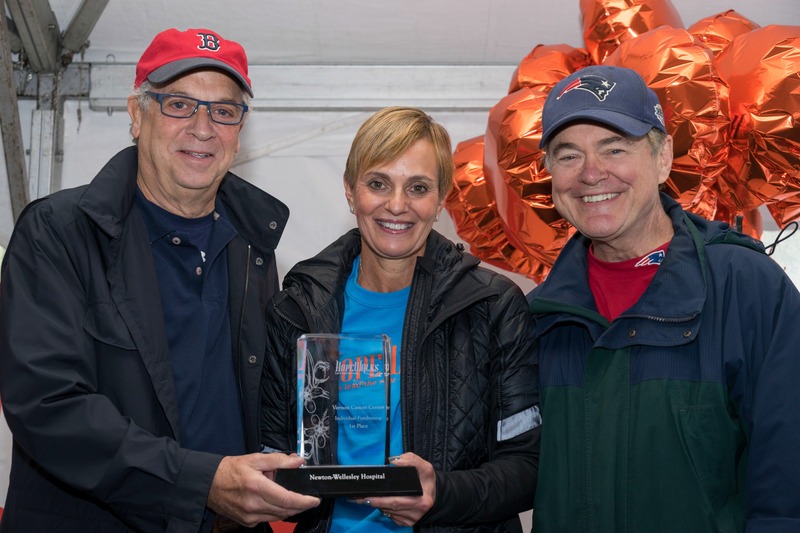 Shown here: WCVB TV 5 Anchor and Wellesley resident Ed Harding (right) with Newton resident Mark Belsky, MD, Chair of NWH Charitable Foundation (left), and Melody Tortosa, Chair of HopeWalks 2016 accepting her award as a top fundraiser. Melody’s team, Bodies by Melody, raised over $19,000 for the Vernon Cancer Center. Category: Do Good · Tags: HopeWalks Raises $225k for Cancer!